How crazy to think I will be coming up on my two-year heart attack anniversary. The days of worry and wondering 'will it be today?' are becoming less frequent. I no longer ponder going to bed at night and worrying that I might not wake up. It may sound cheesy, but I'm a new me. No longer letting my heart attack define me but guide me to a place of advocacy. A place where I can let my "crazy experience" help others and brings funds and awareness to a great cause. I've referenced this number before, but 1 in 3 women will die from heart disease or stroke compared to 1 in 30 who will die from breast cancer. This statics are unacceptable and need to be changed! So I have this little thing called a family. Family, we all know causes us to be an Uber driver, Chef, maid, mom, wife, and master of none. So why would I take on these extra responsibilities? I believe in giving back. And I can't think of a better organization that supports people and families that have been impacted by heart disease and stroke. Many times we all wonder how there can be enough hours in the day to do what's required of us none the less add more. I've decided to become chair of the Go Red for Women Silent Auction Committee and be a member of the Circle of Red. These new areas will allow me to give back to an amazing organization the American Heart Association. The support the American Heart Association has given me at not only a national but local level has been extraordinary. The AHA has allowed me to meet so many wonderful people along the way. The two areas where I will be volunteering are the Go Red for Women Silent Auction Committee Chair and Circle of Red. Go Red for Women is a part of the American Heart Association that "encourages awareness of the issue of women and heart disease, and also action to save more lives The movement harnesses the energy, passion and power women have to band together and collectively wipe out heart disease. It challenges them to know their risk for heart disease and take action to reduce their risk. It also gives them the tools they need to lead a heart-healthy life." The Circle of Red Circle of Red is a society of women who have the passion, the motivation and inspiration to drive and influence change in the community regarding heart health of women in their community and across the country. Circle of Red Women help support the mission of Go Red For Women® by making a personal financial commitment to the movement. 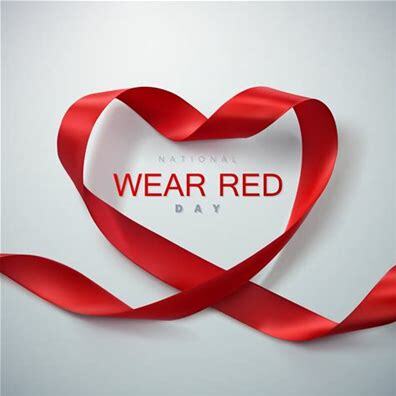 And don't forget to wear RED on February 2nd, 2018!! After surviving a heart attack during a valve repair surgery and stroke post-operative Aunt Trish at the young age of 66 is the most positive survivor you will ever talk with. April showers bring May flowers.. but what does May bring Stroke Awareness. This blog is all about my Aunt Trish a role model for stroke survivors everywhere. At the age of 40, she had a mitral valve repair surgery that led her down the path of a heart attack and a right sided stroke post surgery. But did this make her a victim.. NO! When talking with her over coffee Aunt Trish talked about failure during recovery "NOT BEING AN OPTION." When her doctors told her she would never be able to take care of herself, she simply said "Not an option." And her drive to prove them wrong drove her to be the strong, independent women that she is today! Aunt Trish comes from a family where genetics play a big role. Her Grandfather died of a heart attack and her father had a heart attack at 52y/o and a massive heart attack at 66y/o. When I asked her if she worries for her two daughters Nicole and Krystal and their future she said: "we've talked about it and they have had the discussion with their doctors." She credits occupational therapy and physical therapy with getting her back into society. She said: "there are days when you just want to give up, but you have to stick with it." During her recovery, Aunt Trish would look around and see people who were worse off than her and be grateful for what she had. Many times during therapy people would ask her "Are you here with your grandma or mom?" She was by far, to young to be a victim of a stroke. But as we know strokes don't discriminate. One thing she recalled about her recovery was the role reversal of having to have her daughter Nicole a junior in high school at the time teach her to drive after Aunt Trish had just taught Nicole to drive. May is not only stroke awareness month but also Mother's Day. When I asked my Aunt Trish what this stroke taught her and her daughters she said " Focus on being nice, be good, don't judge, life is short and tomorrow is not guaranteed. Again, I am overwhelmed with her positive attitude! As she says, " An Attitude of Gratitude" Her faith and positivity has helped her to persevere through not only one but three life-changing health events. A cool fact about Aunt Trish and her daughters is the connection to the moon. They always say "Love you to the moon and back." The stroke has brought the three of them into a close relationship no matter how many miles separate them. The pictures above are of the fun times that Aunt Trish has been able to enjoy with her daughters Nicole and Krystal.. and let's say there are many more shenanigans to come!! I asked Aunt Trish what advice she had for other parents who have to talk to their kids about their stroke and she said: " Be open, let them know your feelings what's in your inner heart and soul, that you're going to get through this and do it!" To other stroke victims Aunt Trish's message is "don't give up, keep fighting!" She said, "If I'd listened to my doctor right after my stroke I'd be in a nursing home today." In the end, I asked her does your stroke define you? And without hesitation, she said: "not at all!" When she wakes up some mornings in what she calls a "stroke fog" or her left side is weak she puts one foot in front of the other. She has good days and bad days but as she says "Happy to have an age!" She credits her kids with inspiring her to grab each day, seize it and be kind. In the end, Aunt Trish is not only positive but courageous. Life handed her lemons and she made lemonade. In the end, I hope this blog helps others to understand that a stroke should not define you! You can set your path in life post stroke. Remeber, F.A.S.T if you are ever concerned about a stroke. Time wasted.. Is brain lost! Thank you, Aunt Trish, for sharing your experience of being not only a heart attack but a stroke survivor as well! !